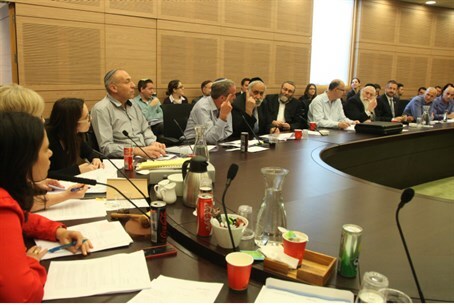 MainAll NewsInside IsraelShaked Committee Debates: Who is a Hareidi Jew? Can the State determine a person's religiosity? MKs grapple with the issue. The Shaked Committee for Equal Burden of Service broached a tough topic Monday, as MKs debated over the question, "Who is hareidi?" The question arose in the course of clarifying the clause in the Equal Burden of Service Law defining what a "hareidi yeshiva" (Torah study academy) constitutes for the sake of the law, which would see hareidi yeshivas fined if they do not comply with the IDF's draft quotas. While legal officials were supposed to have clearly defined the term, Committee Chairperson MK Ayelet Shaked (Jewish Home) said that this was overlooked due to time considerations. As such, the term was left for Committee discussion. "Currently the definition is very broad and I'm not sure that without thorough educational testing in this area, we can ever know who exactly is in each institution," Ya'akov Friedberg of the Ministry of Justice, explained. "This should clarify this section in the law, which currently includes all kinds of institutions that are not relevant here in the context of [IDF] recruitment." MK Motti Yogev (Jewish Home) explained that, as of now, the definition of "hareidi" is usually determined by the yeshiva students themselves. "In 90% of cases, the person who determines whether or not he is hareidi is not an outside institution, but the person himself, who chooses to go to a hareidi yeshiva," Yogev stated. "There are few, if any, cases where a yeshiva student tries very hard to enroll [to a hareidi yeshiva] and is not accepted." "You cannot force the definition on people," Yogev argued, "and say, 'you are hareidi and you are not.'" He continued that if a definition was necessary as a rule, the place that determines this is the high schools, each of which has different educational requirements and programs based on religious outlook. Other MKs were more forceful on the need for a definition. "We have a clause here that is capable of uprooting all of the work done here in the past few months," MK Itzik Shmuli (Labor) argued. "If you say that it's up to two ministers and a Committee chairman to decide, that is not especially reassuring. We have no idea who will be serving in these positions in a few years. Why don't we add an appendix with a list of institutions [to which the law applies]?" Shaked replied, "this is why the public has chosen their representatives [for the issue]. We can rely on the sovereign State of Israel to decide this." "But what if, let's say, we have two hareidi yeshivas that undergo an educational revolution and decide to begin teaching the core curriculum?" MK Omer Bar-Lev (Labor) asked. The core curriculum is generally not taught by hareidi high schools in its entirety, and a change would probably redefine the school as "Religious Zionist" - and subject to different draft quotas as a result. "How do you decide? The definitions here are not clear enough, nor is who regulates them," he said. Shaked ultimately chose to stop the hearing and urged the Justice Ministry to meet with the Ministry of Education immediately to clarify the issue.